Whomever coined the phrase “a picture is worth a thousand words,” perhaps understood the magical feeling evoked by a waterfront view. “I mean look at it,” says homeowner Gloria Derks with a smile, on why she and her husband Ken purchased the property. 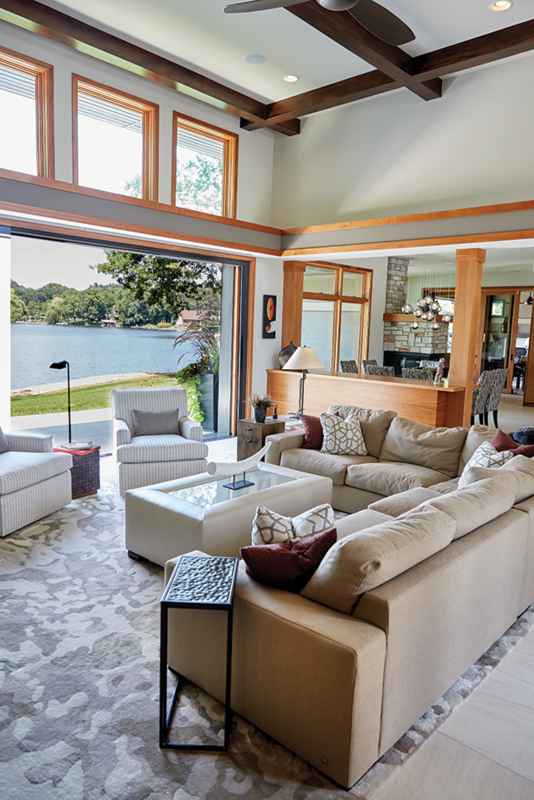 The front door to this Hudson home opens and you immediately feel as if you’re on the lake, because its 16-foot living room wall is an expanse of glass right on the waterfront. “People walk in and they stop at the door and say, ‘Wow!’” says Gloria. Gloria and Ken built their new home on a unique private cul-de-sac peninsula with only two other homes on it. The property sits on Lake Mallalieu, which connects to the Willow River and flows into the St. Croix River. The property had small cabins on it years ago, but more recently sat without any structure prior to this new construction. Originally from Hastings, Minn., Ken and Gloria have been boating on the St. Croix River for years. They now split their time between Hudson, Wis. and Texas and enjoy spending time with their family in the Minnesota and Wisconsin area. “We had never lived on the lake and wanted to have a retirement place close to family,” Gloria says. The Derks hired Bruce Lenzen Design/Build of Hudson to construct a dream home that would maximize the stunning 360-degree lake views. The result is a stunning soft-contemporary style home, with three bedrooms—including a main floor master suite—three and a half baths, plus a doggy bath. The home was completed in June of 2017. The home is a slab on grade, designed to have main floor living, as well as an additional upstairs space with a second living room, office and two bedrooms for family and guests. The Derks desired a space less traditional than their previous homes, and would function well to entertain family and friends. “This particular home touches on every single setback on this lot,” says Lenzen. “It wasn’t about size really; it was about correct function for each room.” The home is over 4,000 square feet including a porch. “The lot is small, but it’s amazing what you can put on it using every corner,” Ken says. While the home has an open concept, each space maintains its own identity through many custom architectural details. For example, a low bank of built-in cabinetry divides the living room and dining room. A three-sided fireplace helps define the bar area from the dining room and kitchen. A drop soffit over the large center kitchen island helps ground that space and also makes it a focal point. “The soffits help take a large open space and brings it down to human scale, it makes it more comfortable,” Lenzen says. There are soffits repeated in the great room as well. Off the kitchen, an elevated breakfast nook and bench offer even more seating. Each element helps to define the functions without obstructing the most important element—the view. “It still feels very intimate, even though it is very long and big,” says Ann Ludwig, interior designer of ALL Design Group in Hudson, who worked with the couple from the blueprint stage. “We had a party recently and it was really fun because everyone could see each other, and people were moving around,” Gloria says. There are sliding doors in the master suite, the living room and one on the four season porch. All of the windows and sliders have custom window shades that let some light through, while matching the wall color. They are built into the structure and disappear cleanly into the ceiling at the touch of a button. Carrying many of the interior design features outside helps draw the eye outdoors. Most notably the large 24 x 24 inch tile floor continues beyond the sliding glass door to the outdoor porch. The tile floor is also heated for winter. “It really invites you out. Suddenly your living room makes you feel like you’re outside,” Ludwig says. The indoor granite bartop is also used on the outdoor grill space. The exterior stone and stucco are repeated indoors on the wall and fireplace and bronze hardware matches the metal roof. All these choices help tie the color and texture elements together. When it comes to the interior finishes and furnishings, the home is minimalist but comfortable. This look was achieved with choices of matte finishes in countertops and backsplash and the choice of wood. The home has beautiful millwork, beams and clean lines of flat panel cherry wood cabinetry. The floor and walls are light, and the baseboards are painted so they visually disappear. “By eliminating that baseboard now your eye gravitates toward cabinets, trim, the other millwork in the space and furniture,” Ludwig says. Adding soft fabric textures in rugs and furniture to balance the harder wood and tile elements complete the look for this cozy lakeside retreat. It’s hard to choose a favorite with a view from every room, however the couple still has their favorite spot. “When we’re here alone, I like to sit at the bar with my computer,” Ken says.